Three years ago I was living in nearby Kingston and visiting my grandparents each weekend – as I had since I moved out on my own to attend college. My grandfather, who I mainly credit with my green thumb, was in the throes of the worst gardening season of his life. 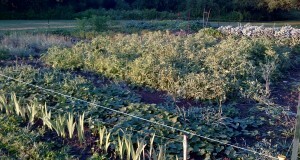 Deer were decimating the garden and virtually no vegetable made it to harvest. My grandfather’s age and the increasing tumult of his health led him to decree that his gardening days were done. Not wanting to see the garden grow over I decided to take up the larger-than-average garden for 2013. My suburban garden in Kingston. I had already been gardening at my home in Kingston, as I had gardened in every place where I had lived and had access to even the smallest parcel of land, but gardening on the island would be different. For one thing it would be largely gardening in absentia due to living in Kingston and only being on the island two or three days per week. 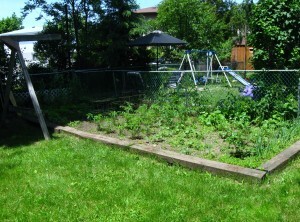 Additionally my grandfather’s garden was, even initially, larger than any garden I had tended on my own before. Also, the deer were a noted problem. As the winter of 2012-2013 progressed, my plans grew. The yard surrounding the garden was one of the largest pieces of open area on the property, so it didn’t take much for me to decide to expand the garden a bit… and then a bit more. By April of 2013, when it came time to work the garden my plans had ballooned to some 5,700 square feet. 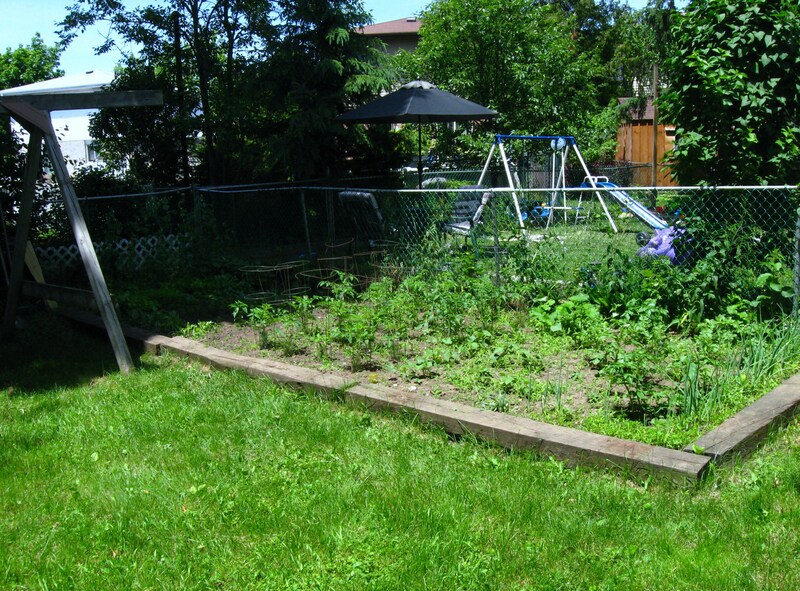 Each time the planned size of the garden grew it was accompanied by a rationale – I would donate the excess, my large family would help with eating the surplus, I would give up my home garden in Kingston – this helped make the growth the garden seem more reasonable. More reasonable to me, at least, because I’m fairly sure my family thought I had lost my mind. 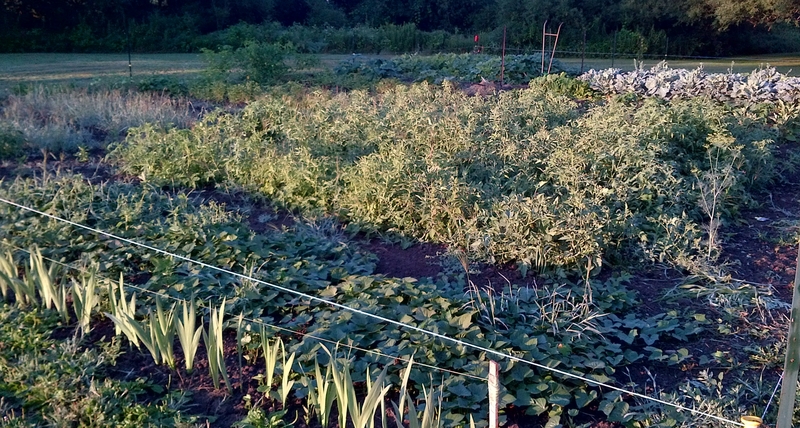 As it happened the garden in 2013 was a resounding success (granted it was a near-perfect growing season here). I ended up with bumper crops of nearly everything that I planted. My trials of new vegetables and new varieties – made easier and more numerous by the increased garden area – thoroughly sated the curious side of the gardener in me. And, I learned more about seed saving in that year than I had in all my previous gardening experience combined. My grandfather’s health continued to deteriorate; he was plagued with pneumonia four times in 2013 alone. So as summer turned into fall I was spending more and more time on the island; helping where I could. At some point in the early winter it was decided that I would move from Kingston back to the island. It was always where I wanted to be, and always where I knew I would end up. This would allow me to be even more helpful – since getting a week’s worth of work done in three days, and then going back to Kingston to work my part-time night job for three more, were beginning to wear me down. This move meant that I could grow an even larger garden, which would mean more produce, and more excess. Since I would be leaving my job in Kingston it would also mean that I would need another source of income, thus the two ideas – my love of gardening, and the need for income – dovetailed nicely into the idea of selling the excess vegetables from the garden at the local market. 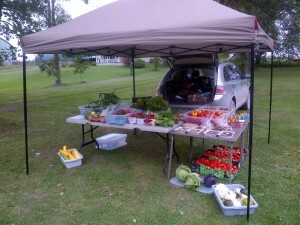 Market stall – Sept. 13. 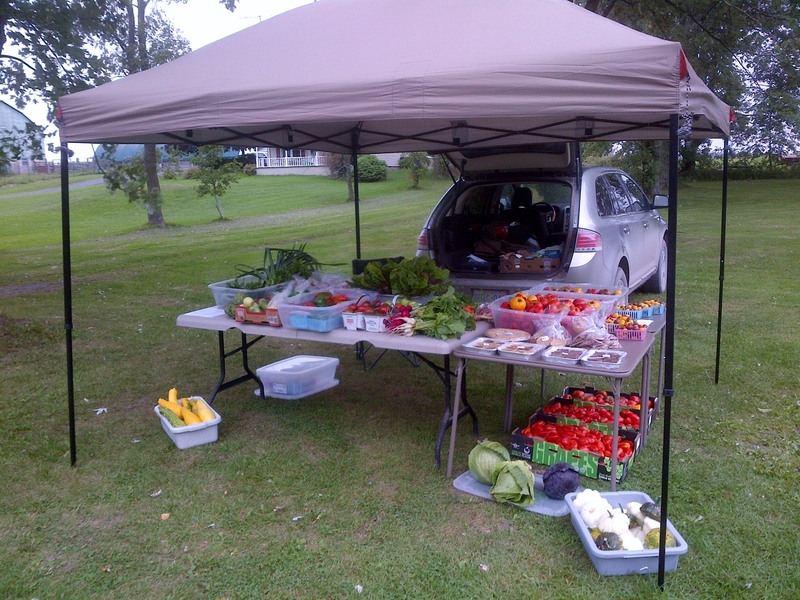 The local market on Amherst Island is small, on an average week there are a half dozen vendors, of which only two (including myself) sell vegetables. However, what the market lacks in size it more than makes up for in loyalty amongst its weekly patrons. Before selling at the market I had never attended it – well, except for a couple of weeks in the spring of 2014 in order to ask questions and find out what I needed to do to set up a stall. I was extremely nervous the first week, but the welcome was warm and the customers were generous. I’ve read in several places that one shouldn’t expect to make money from a market garden in the first year – and my experience was no different. But the garden – through sales at the market, as well as some direct sales made by request – ended up paying for itself, with some left over some money for seeds for the coming season. As long as I don’t consider the value of my time I can call that a win (and I do). I made money doing what I love – what else could it be? The 2014 growing season was tough, and selling at market was mostly an afterthought, but it was a success nonetheless. It has convinced me that market gardening is enjoyable and do-able. I’ve learned over the past two years that I can Grow Big and that I can plan a harvest and project(ish) harvest amounts. And buoyed by that knowledge, and the passion that I have for gardening, I am looking forward to the 2015 growing season – and growing my garden and my markets as well. I am also looking forward to this blog, and sharing those experiences with anyone who wishes to read about them. 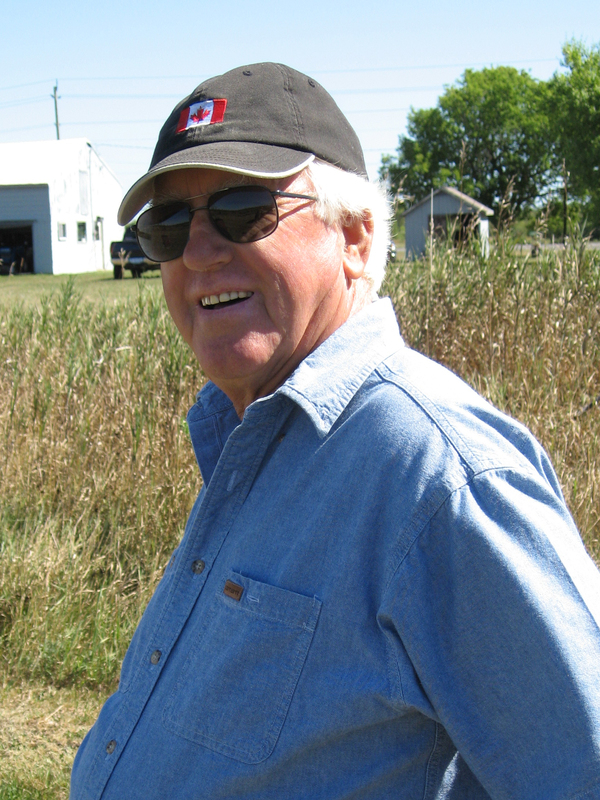 I wish that I had been able to share with my grandfather the joy and success I had growing for market in 2014, but on April 27th he succumbed to his illness. I hope that he knew how much all those years of gardening along with him taught me; I hope he is watching me and is proud of me for trying to make successful something that I love so much. I miss him. Really enjoyed reading your journey back to AI and continuing your grandfather’s tradition and expanding on it. Your web site is impressive, very simple, down home friendly and informative. The only reason I do not shop at the Farmer’s Market, is we have our own small garden, growing what we have found does well and what we like to eat. Wishes for your continued success, Terry and sounds like you will succeed as you love what you are doing.